Beginning comedy writers and performers may think funny can't be taught, but legendary comedy writer Gene Perret, winner of three Emmy Awards, tells otherwise in this guide to what makes a good joke work. 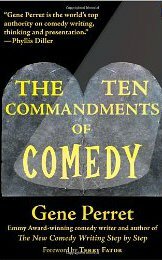 Outlining the 10 commandments of comedy, the unbreakable rules that every gag must follow in order to be funny, this book liberates readers and allows them to immediately begin writing better and funnier comedy material. By following Perret’s commandments, readers will better understand how to write jokes that connect with audiences and discover why unsuccessful material isn’t working and how it can be fixed.